As example we’ll use the CSN-71 ‘Elysia’ of the Tenorran Defense Navy. The Flagship is a nuclear powered amalgamation of a shipyard, an aircraft carrier, a tech center, and a military base, a heavily armored and well armed one, at that. It functions as the “command center” for TDN players, producing the first available TDN units, such as the Carryall and Constructor, the Command Frigate, and the Strike Fighter, but also higher tech units after progressing further up the tech tree. The four large rectangular slots on the front of the central hull, and on the right hull as well, are upgrade slots, filled as one advances through the tech tree, adding a unique module for each tech level. On the right hull, the Elysia features a large double helipad, where two large VTOLs like Carryalls or Gunships can park to be resupplied and repaired. The left or port side hull features a far more prominent flight deck, with a landing strip on top in the back, and a lower catapult deck, where regular fighters take off from. The Elysia can hold 2 large VTOLs and 5-6 squadrons, each consisting of 3 aircraft. The Elysia is in no way short on firepower, with its 6 twin 8″ gun turrets, omni-purpose vertical missile launchers, and 8 close-in weapon systems, it can easily deal with small groups of enemies, but it’s still unwise to use it as an attack unit, despite its enormous pool of hit points, it can’t hold up against sustained fire from larger enemy groups. Another feature of the right or starboard hull is the resource dropoff, here Carryalls can deliver resources harvested by mining platforms. The central hull features the shipyard, where gunboats, corvettes and frigates can be built, but nothing as big or larger than destroyers or capital ships. 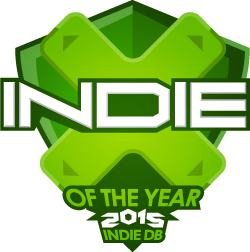 As mentioned above, the Indie of the Year competition is currently running on IndieDB, head on over and vote for us, clicking the image below! At this point we’d like to give a shout-out to Global Conflagration, a Real Time Strategy game where players take control of the battlefield using the deadliest of weaponry and units in a clash between two powers: The EU, armed with most advanced technology and high tech equipment, or The Awakened, driven by the sole purpose to fight for their freedom by all means possible, including the use of technicals and improvised vehicles. Global Conflagration shares the same RTS Framework and engine as Ardent Seas. That’s it for today, we hope you enjoyed this little update! Follow us on Twitter: @Ardent_Seas and on Facebook!